Niue’s organic noni farm remains in business despite one of its owners, the Reef Group, going into receivership in November 2012. 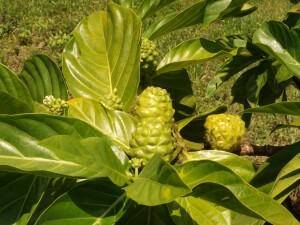 The Niue government was in discussions in November 2013 with authorities in Thailand on the potential to export noni leaves for tea. For the last year it has been maintaining the joint venture noni farm and meeting market demand from Asia, despite the loss of its partner. The Premier, Toke Talagi told Radio New Zealand that the noni industry has a positive future in Niue. The Vaiea farm, a joint venture between the Reef Group and the Government of Niue, was officially opened in October 2004. Its processing plant – described by the business owners as the most technologically advanced in the Southern Pacific – is capable of producing 100,000 litres of juice a month. Fruit from the farm is supplemented by fruit gathered from Niue’s native forests. Noni (Morinda citrifolia) is an evergreen bush grown mainly in the islands of the South Pacific Islands and Southeast Asia. Its white fragrant flowers bloom out of cluster-like pods, which bear the noni fruit. The fruit, which resembles a small bread fruit, is fleshy and gel-like when ripe. The juice is extracted when the fruit is almost ripe. It taste and smell are not pleasant but its health promoting properties have been recognised as a natural remedy in Polynesia for thousands of years. Its main attribute is its proven ability to boost the body’s immune system. The main active ingredient in noni is proxeronine, which is converted by the body in to xeronine. Xeronine is a critical biochemical compound involved in a wide range of normal biochemical reactions of the human body. The farm began an expansion programme in 2011, with the aim of doubling its size from 60 ha to 120 ha. Niue premier Toke Talagi says the government is waiting for Reef’s receivers, PricewaterhouseCoopers, to say what they will do with their shares. Reef also had a half share in a huge fish processing plant on the island, which has been mothballed for seven years. For more information about noni juice and how to buy it, click here. Hi there how do we purchase Niuean Noni here in NZ?